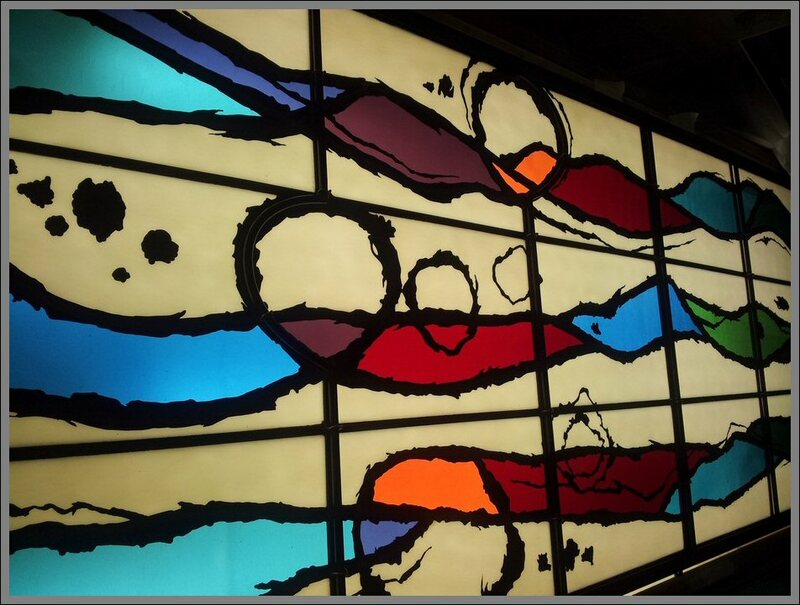 This large scale contemporary stained glass window, designed, produced and installed by Lightworks, was completed in July 2013. The panel measures a substantial 800 x 2200mm and was installed in a custom manufactured steel, L.E.D back-lit frame. Our clients brief was to produce a large, abstract, contemporary statement piece to provide them with a stunning focal point within their newly designed and built Yorkshire residence. Our design is based on a very simple lead-work matrix making maximum use of the contrast between the semi-translucent white glass and richly coloured, hand blown, cylinder glass. This contrast was then accentuated with the application of the black hand painted and kiln fired detailing, giving a much more organic, free flowing appearance. This image shows the upper section of the panel, taken on the studio light-box just prior to delivery and installation.